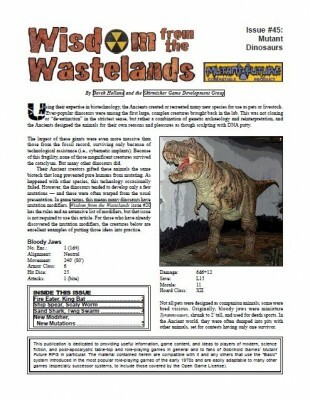 Skirmisher Publishing has posted issue 45 of Wisdom From the Wastelands up online for your reading pleasure. Using their expertise in biotechnology, the Ancients created or recreated many new species for use as pets or livestock. Ever-popular dinosaurs were among the first large, complex creatures brought back in the lab. This was not cloning or “de-extinction” in the strictest sense, but rather a combination of genetic archaeology and reinterpretation, and the Ancients designed the animals for their own reasons and pleasures as though sculpting with DNA putty.